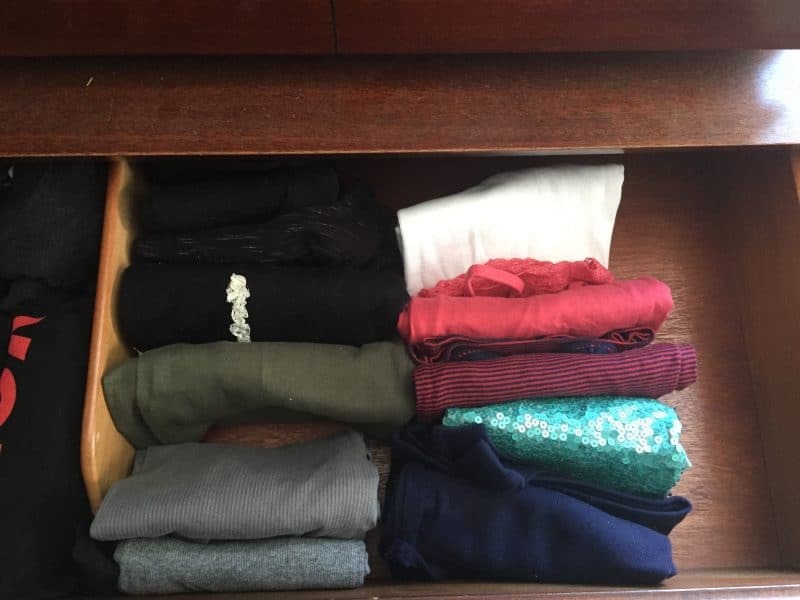 Like everyone else in the world, I’m obsessed with the Netflix show “Tidying Up with Marie Kondo.” There’s something about the weeks after the excess of Christmas that makes me want to clean all the things and declutter like a mad woman. 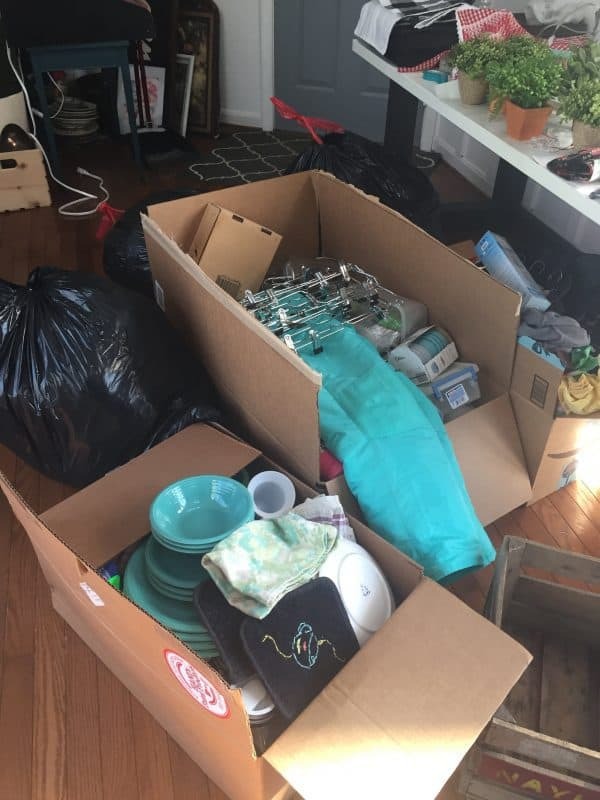 Over the past few days, I’ve started my own KonMari Journey using advice from the show and book. When the book first came out, I tried to read it, but I just wasn’t ready for it at that time in my life. In January, I always get into a bit of a funk and I knew that I needed help getting out of it. One day, I watched an episode and I loved it. I expected to hate the show because I don’t normally watch reality shows. But there’s just something about it that really helped me get started. If you’re looking for motivation to get started on your own home, I highly recommend watching an episode or 5. Marie Kondo is so kind and non judgmental. She didn’t judge people who were borderline hoarders or had crazy collections. The diversity! I loved seeing so many different family structures, ethnicities, homes, and problems. It felt very relatable in a way that those shows normally don’t. Relate-ability. It’s not about having a picture perfect ending. None of her solutions are not product based (ie. buy this magic solution for all the problems!) She uses shoe boxes and wire shelving (which don’t spark joy for me, but are very accessible for people.) The end results were homes that felt lighter, cleaner and seemed to function a lot better. She’s adorable and it makes the whole process feel doable. Keeping things that spark joy is a great way to get over the guilt of letting stuff go. Besides that stuff is doing you no good when you don’t use it. Even if you get rid of something brand new, it has served it’s purpose in teaching you a lesson. How to shop in the future. Every thing that you get rid of will give you insight into what not buy in the future. Look for patterns to learn what not to buy. It’s easier the more you do it. I think I’m addicted to throwing stuff away! Less really does equal more. Seeing a mostly empty closet makes me happy because it’s filled with stuff I love. Without asking, your whole family may feel inspired to tidy as well. I would have laughed if someone would have suggested this a few years ago! But I’m finding it to be true. 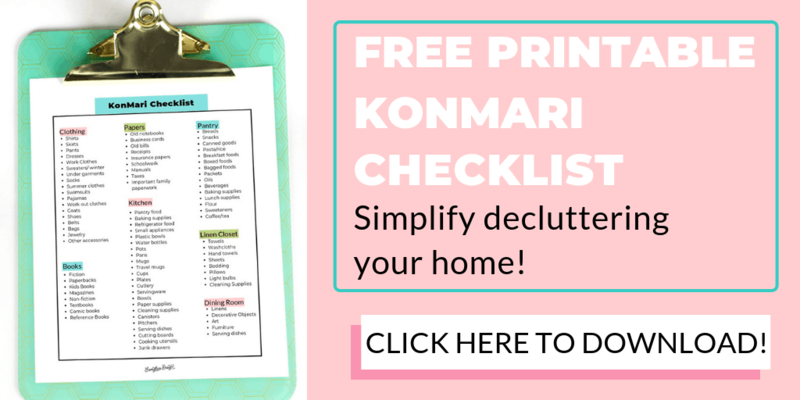 Download a Free Printable KonMari Checklist! Despite her advice to start with clothing, I started in my entry way. My entry way was so crowded that we could barely walk through it and we had a snow storm on the way. It needed to be functional for that. Plus, clearing the room gave me space to place all the discards. It was also an “easy” space to tackle, which made it easier to gain motivation. Entry way “during”. I don’t want to say after because this set up doesn’t work for us and needs to change. After the entry, I cleaned out a linen closet, the kitchen, and then my bedroom. 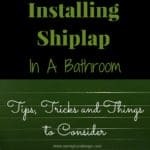 Next I will do my bathroom and continue through the house, room by room. Linen closet before. 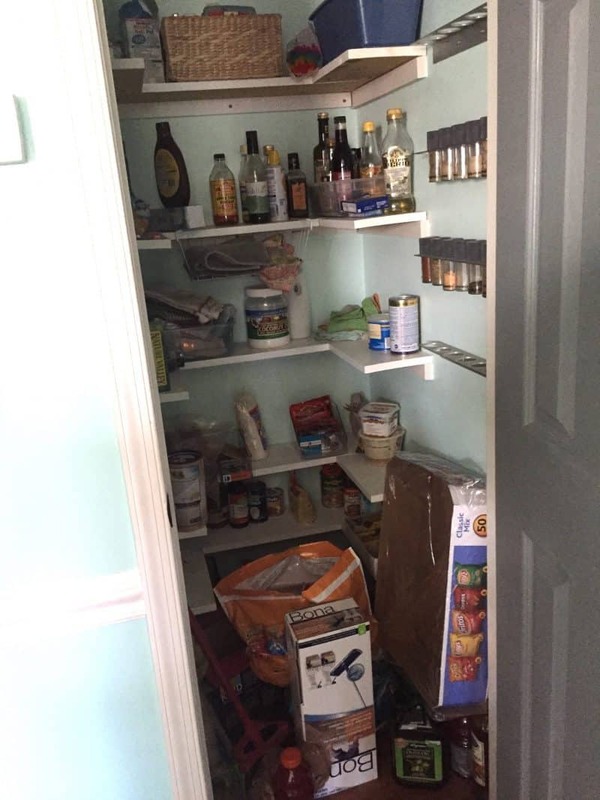 It was used as a pantry before we built one. Linen closet after. Awaiting a clean load of towels from the dryer. There’s even room for the vacuum! 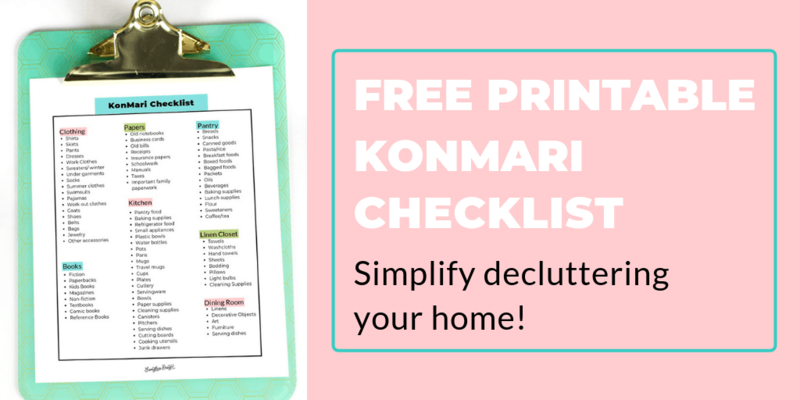 Get a free printable KonMari checklist. I started this process by telling my husband that I didn’t think we would have enough space for everything! Almost every shelf and drawer has a lot more empty space now! It turns out that we have plenty of space. Don’t keep food for a diet you don’t eat anymore. I’ve been gluten free for 2 years, but I still had wheat products in the house. For the most part, we don’t cook with those items anymore. Don’t buy one-off ingredients. If you don’t know what else to use it in, skip that recipe. You won’t come up with a magical use for hemp hearts. Or probably use them in that weird recipe either. Buy food for the life you have, not the life you want. I need quick, easy meals that my kids can cook in case I’m too tired by dinner. AKA, no hemp hearts allowed. Pay attention to your what you’re getting rid of. Plastic containers are my weakness. I had containers of all sizes and shapes. But I only like a certain kind. So I threw out all of the other ones without guilt. And I’m replacing them with the one brand I like that stacks nicely. Lesson learned, only buy that one brand! Pretty dish towels spark joy for me. So I’m throwing out all of the ugly stained ones and replacing them with pretty ones. Specialty appliances are always a waste of money. I’m looking at you juicer. No more buying one use appliances. 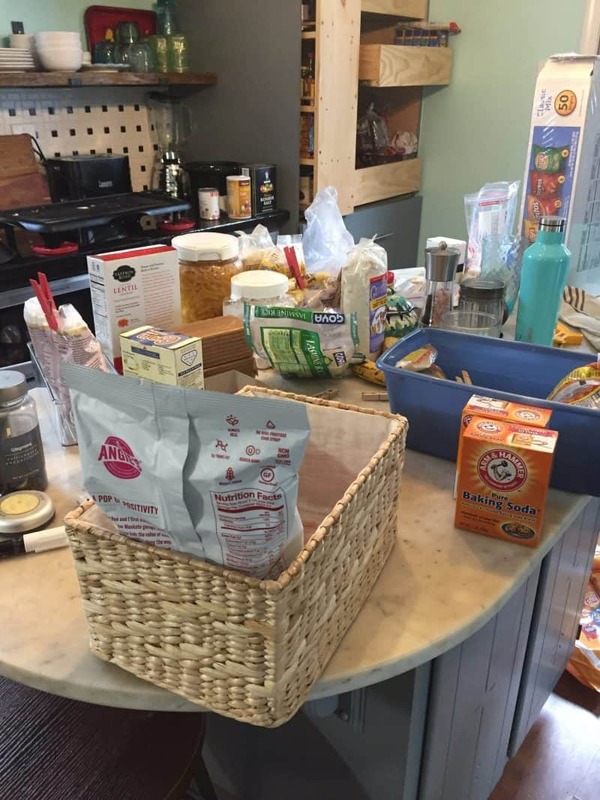 Click here to see how we redid our kitchen! Y’all, this part was hard. 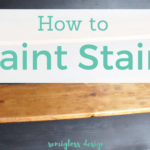 When I was talking to my husband about this process, I teared up. For years, I bought into the idea that being a middle class mom meant shopping a lot. I bought a ton of brightly colored clothes to combat the long winters, but I hated how they looked on me. So I still had nothing to wear. Those jeans that were a tiny size only made me feel bad when I saw them. The clothes that I had made for myself when I used to sew, also made me feel bad. 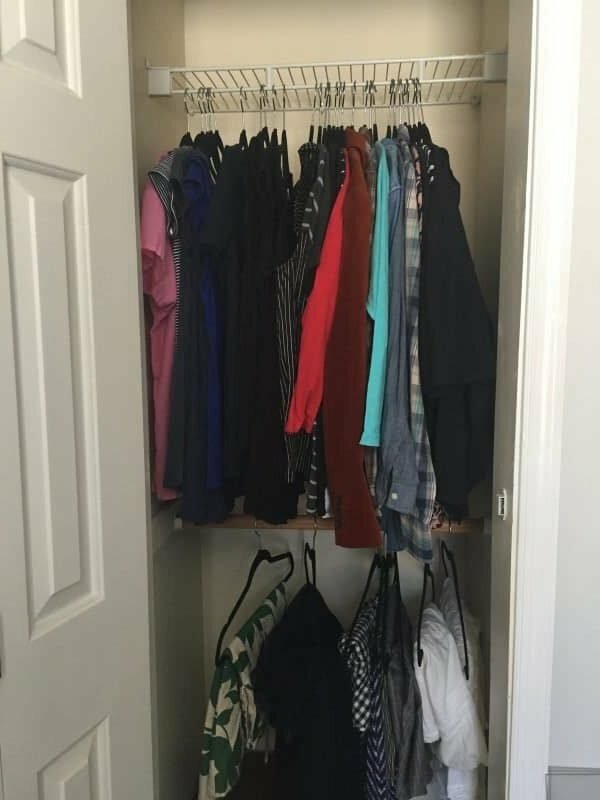 My closet was bursting to the brim and I had run out of velvet coat hangers. The old me would have just added more storage containers instead of going through my stuff! I started by piling all of my clothes from my closet onto my bed. 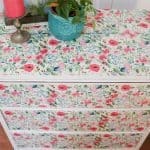 After the closet, I worked on the clothes in my dresser. It was easy to choose what sparked joy and place it back in the closet. I’m still trying to figure out what I need in my closet for this life, but for now, I have a lot more space. My drawers actually close. Getting dressed is already easier and those folded clothes really make me happy in the morning. 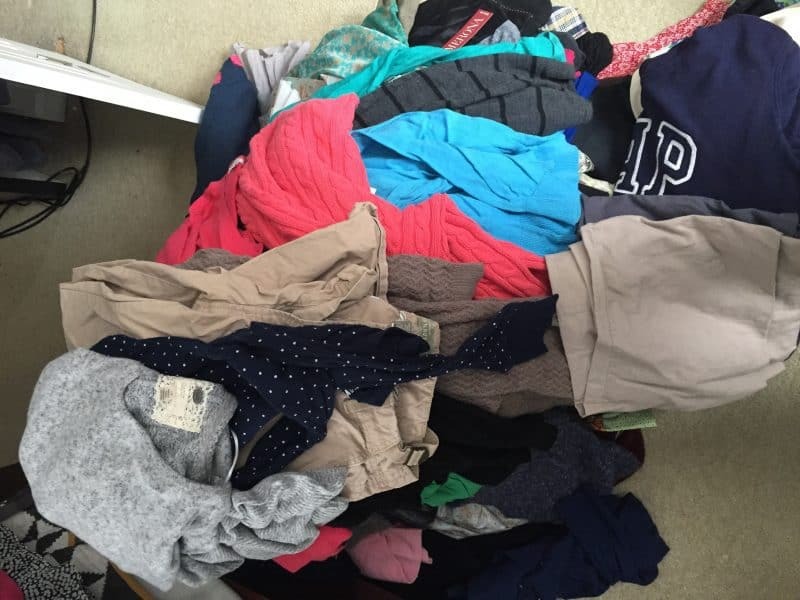 Pile of clothes to be given away. It was over 2′ tall! No more fast fashion. Everything I kept was nicer brands that doesn’t fall apart after a few washes. I would rather invest in a few nice pieces and wear them. In reality, there’s only a small portion of clothes that I actually wear. Shouldn’t they be the best? Try on clothes before buying them. I threw away several items that I had bought (usually from Marshall’s) because they were cheap. But when I put them on, it looked like I was wearing a potato sack. So wasteful! Buy for the life you have, not the one you want. I build, paint, and work in a barn. A closetful of dresses, while lovely, does me no good. That’s not to say that I need to get rid of all of them. I kept what I love and feel beautiful wearing. The majority of my closet needs to be for clothes that I wear on a daily basis. Doing this process made me realize that I only love wearing dark colors. I love bright colors in theory, but I hate how they look on me. This really made me question my identity. Does this mean that maybe brightly colored decor isn’t really for me? I’ve slowly been coming to this conclusion in a different way, but this really confirmed what I had already been thinking. Identity crisis alert! Life’s too short for un-comfy undergarments. Get rid of those socks that roll down or are too tight around your calves, crappy underwear that fit improperly and bras that squeeze your insides. Let them go. Same goes for shoes. If you can’t wear them without pain, get rid of them. Invest in nicer shoes that don’t hurt. They do exist. Boxes and bags of donations. Have a big box of trash bags. You will throw out and donate way more that you think. I’ve already used about 25 bags. Start right after trash day so that your trash can is empty. Same for recycling. Mine are filled to the brim and now I have to wait until trash comes so that I can do more work. Don’t get rid of your boxes before hand. You’ll need them and regret it. You can replace them later with prettier options. Large boxes are great for donations. 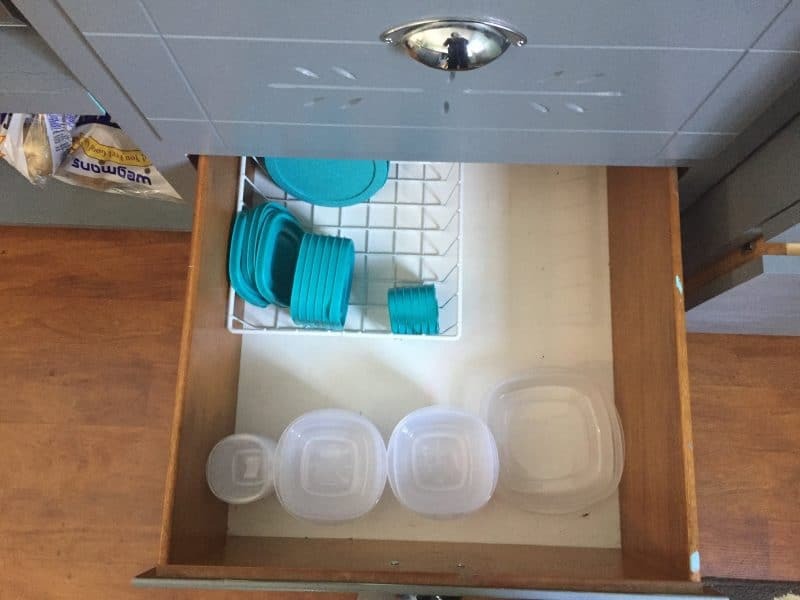 Smaller boxes are useful for organizing smaller items. If it’s a space that you haven’t touched in a while and you’re allergic to dust, take an allergy pill beforehand. Trust me. Start with a space that is easy for you. If you’re attached to clothing and have a lot of emotional baggage attached to them, find an area that you don’t love first. For me that was the kitchen. Go in with a good mind set. It’s not a punishment. It’s an opportunity to make your house work for you. Give yourself grace. I allowed myself a “maybe” pile when sorting. And almost everything ended up in the donation bags after I tried them on. But it helped with the guilt of getting rid of new-ish items. Donate all usable items. But be realistic about what a thrift store can resell. They don’t want your old, stained towels or underwear. Gently used only! Keep going and don’t break the momentum. It starts to feel addicting. Folding stuff to fit your drawers vertically is annoying, but it saves so much space! Talking to your items. Unless it makes you feel good. I think it’s just as good to talk about the lessons you learned from those mistake purchases. Besides, thanking every single item would take some serious time. I filled 7 giant garbage bags full of clothing! Work in silence so that you can hear the items. No thanks. I like working with music or podcasts to make the tasks enjoyable. You know which items bring you joy without much thought. Getting rid of the guilt to let them go is the hardest part, but once you’re past that, your hands do the work automatically. Working in categories, when 90% of the home falls into “komono.” What about linens? Collections? 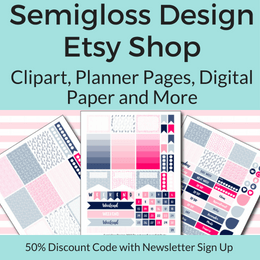 Hoards for your shop? Craft supplies? And besides, I want each room done 100% before I move on to the next. This process is more about figuring out what to keep than how to keep it once you’ve decided. 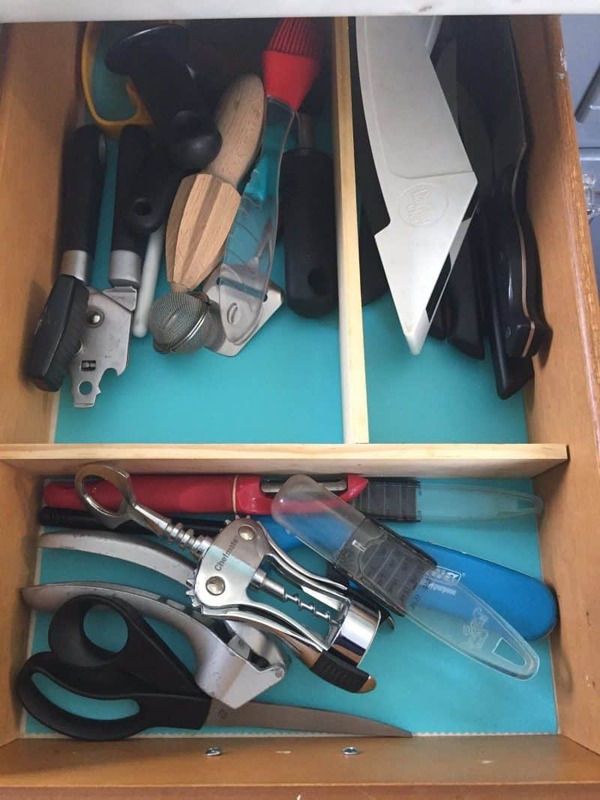 Marie Kondo has some methods she suggests for folding and she uses boxes to sort things, but she doesn’t have suggestions for adapting or creating storage systems. She mainly uses what already exists. But what if what exists, just doesn’t work? For instance in my entryway, I use a bench and baskets for shoes, with hooks on the walls. 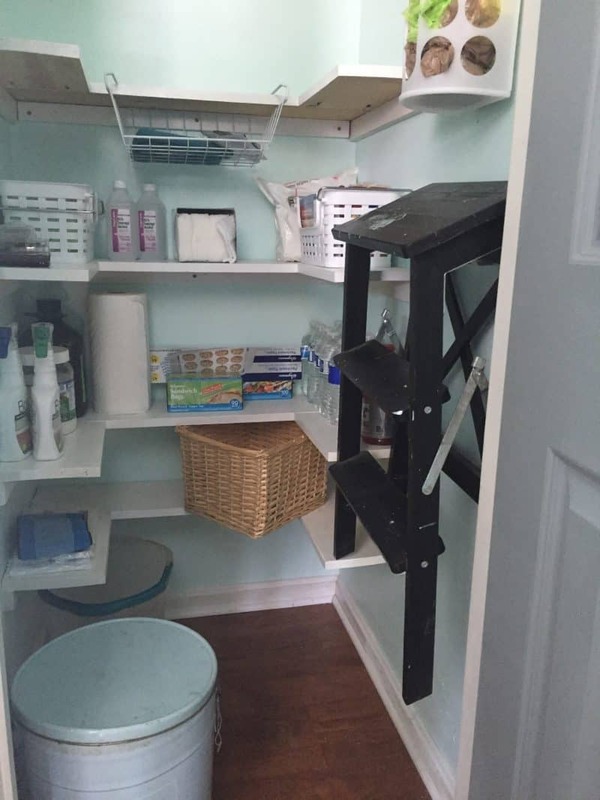 Every picture on pinterest tells you that your entry needs a bench with hooks above it. And maybe that works in climates without winter. Or for families with small children. 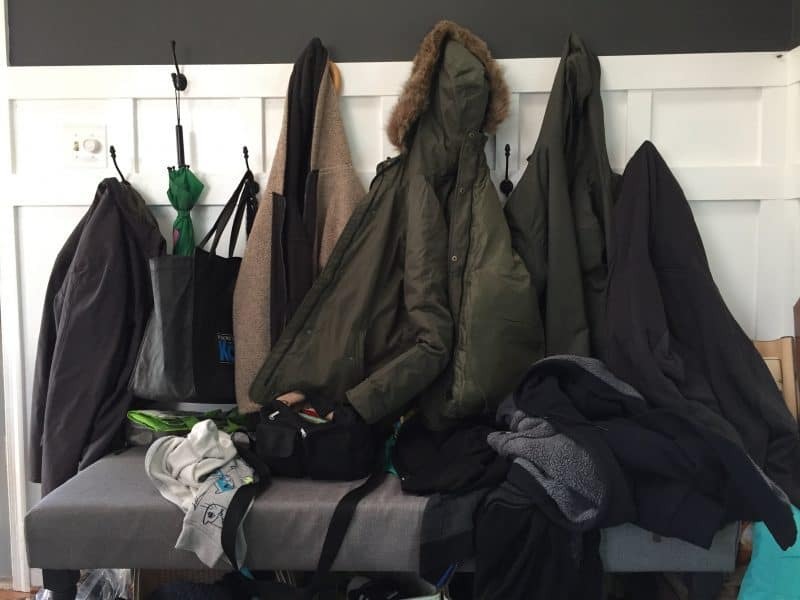 But for full size winter coats, it just looks like a hot mess every day. And that bench is useless. No one can sit there. Also, hooks can’t hold the 50 pound backpacks of high school kids. So it’s up to me to design a new system that will work for us. First step, lose the bench. Also, this area *should* spark joy. But it also needs to function for the people who live here. I have a feeling that this concept will follow me throughout my journey of creating a home I love. The thought of an entire home that is filled with only items that spark joy would be amazing. I’m currently planning small tweaks for rooms that I’ve completed to make them 100% joyful and functional. So stay tuned for those exciting changes. 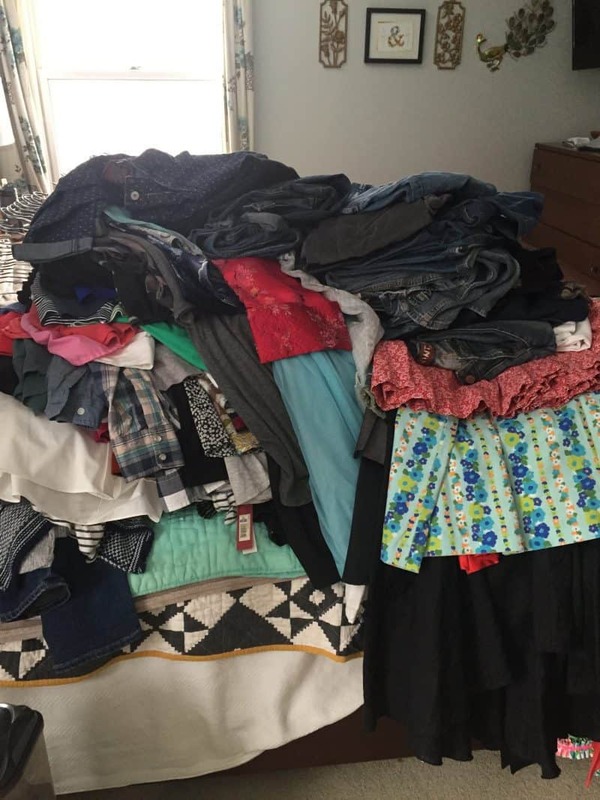 Final Thoughts: Is the KonMari process worth is so far? Absolutely. It feels like I’ve lost weight. And I have! The weight of all that guilt for unused items is gone. I didn’t even realize that it was effecting me until it was gone! The KonMari process really is life changing in ways that I never thought. My kids have started the tidying process on their own without being asked because they see the joy that it’s bringing me. 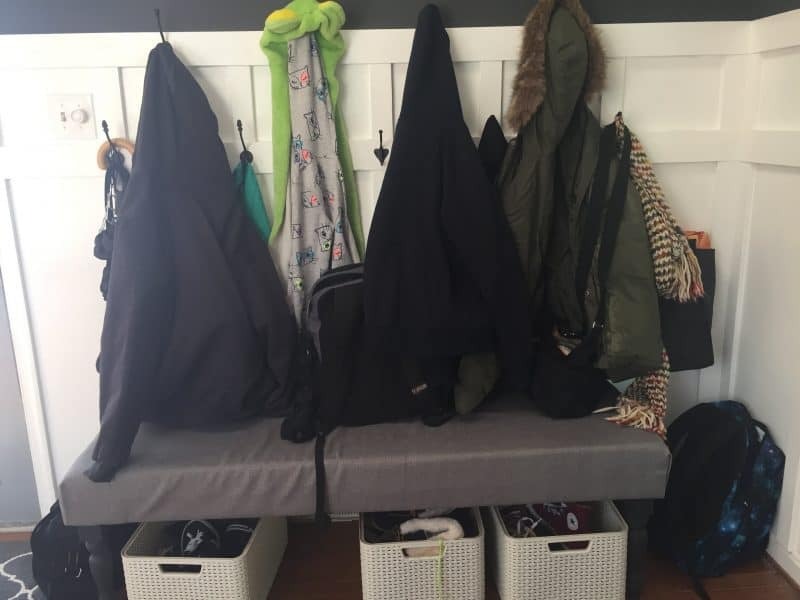 We recently helped my daughter organize her room using the KonMari method with amazing results! Best of all, I have clarity in how I want my home to feel and function. 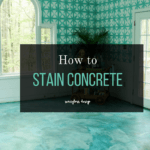 This makes it easier to move forward to create a home that I love. 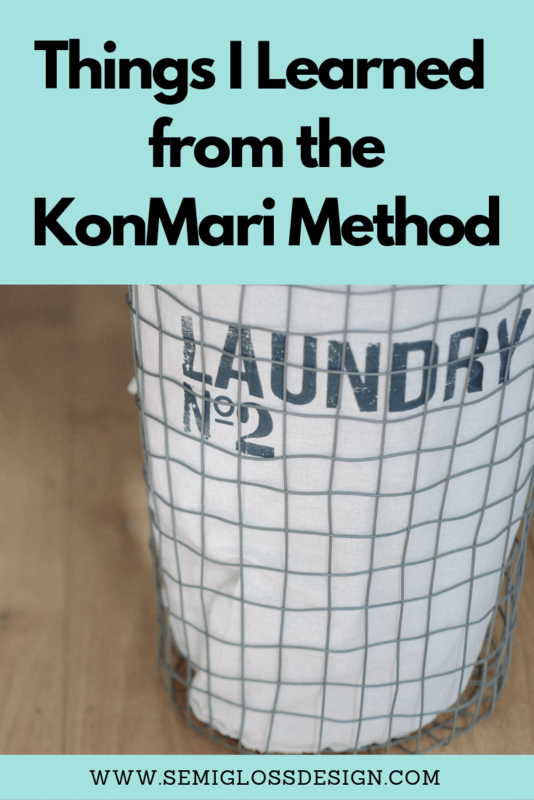 Don’t forget to download that free KonMari checklist!